This page details the Type 3 installation. This installation is installed in the Campus Center extension, and was installed around 1994. The system covers a food court and a Barnes and Noble Bookstore. Please note that this is how the system looked as of 7/15/2010 and several building modifications have occurred since then and as a result, what is seen here may not reflect exactly how the system components exist today. This is the system they installed when they did the installation. It is a Simplex 4100. First off, the pic on the left. It’s an auxiliary panel, which basically controls the system’s accessories. In the case above, it’s mostly ventilation fans and dampers for the food shops, but it does control a few other odds and ends. Second the panel on the right. It’s the main panel for the addition. Despite the fact that the system is a Simplex 4100, which is an addressable panel, the system is not set up in an addressable manner: that white sheet of paper you see in the door is not emergency operating instructions, it’s a zone sheet. Despite what one may think, this system is NOT connected to the new system installed in the main campus center building in 2001, nor is that system connected to this one. This is the remote annunciator. As with the rest of the annunciators on the Podium, it is Simplex model 4603-9101. And no, that’s not an illusion, it IS in alarm mode! As you can see, there are 10” bell/strobes installed as the signals. The bell is model 2901-9333 on a 4903-9105 strobe plate. Also, note the fact that the retrofit plates are not installed correctly. This is because the diameter of the bell is too large, so the installers had no other choice but to install the signals as you see. 4904-9176 strobe) can be found in Zepps, a sub and salad shop. Apparently, these signals were added after the initial installation, either because coverage wasn’t enough, or a shop was rennovated and the old signals were replaced. The third signal (Wheelock MB-G10-24 10” motor bell on an RSSP-24MCW retrofit plate) is a replacement signal due to one of the old signals no longer functioning. The Sbarro shop has since been redone and it is unknown at this time if the signal still exists. 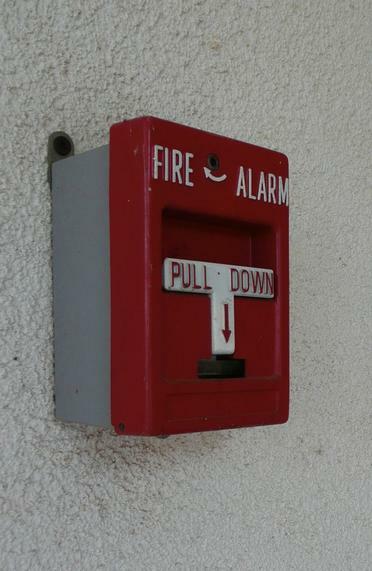 Unlike the rest of the systems installed on the Podium, because this was installed in 1994 and code-3 was not a mandatory requirement evacuation signal, the system is programmed for continuous. But similar to the rest of the systems here on campus, the system is programmed for audible silence, when upon the system being silenced, the bells stop ringing, but the strobes remain flashing until the system is reset. These are the smoke detectors that are installed, and as mentioned, they are non-addressable. The first detector is model 2098-9202. They are photoelectric with a built-in heat sensor, so that if smoke isn’t present, but the temperature gets too hot, the heat sensor will trip the alarm system. The second detector is model 4908-9601 (with model 4098-9788 base). These are installed in areas that were recently renovated (the same area with the Faraday/Simplex bell/strobe). And these are the pull stations installed. The model # for the first one is 2099-9768. This type of pull station often is referred to as a Chevron. The second one is a Simplex 2099-9756. It’s only installed in one location, and that’s in front of the register at Zepps. Why it’s there, I don’t know, nor do I know why it’s dual-action. The third one is the most mysterious, as not only is it not a Simplex pull station, but there’s also no label on it to identify the manufacturer. With that said, I am also not sure of the model #, however it is generally seen with the model # RMS-1T. There is only one pull station like this and it can be found in the Outtakes convenience store. And that’s Type 3 (Campus Center Extension)!